It is 500 meters from the Lešniks farm to their nearest neighbours. Next to the house is a protected linden tree and a double hayrack roofed with shingles, there are two wells in the courtyard and all around are meadows. If you are interested in domestic animals, you can take a look at their cattle, horse, pigs, dog and cats. The Lešniks run an organic farm and everything that appears on the table has been produced organically: vegetables, fruit, home-made brandy and cider. The farm has the BIODAR trademark. Basic services include a seminar room, parking lot, garden, washing machine and dryer and picnic area. Activities on the farm include hiking, skiing, cross-country skiing, horseback riding, table tennis, bicycling and children's playground. Healthy food is best accompanied by an active holiday: there are numerous possibilities in the area for trekking, cycling or picking medicinal herbs. In the winter, visitors can ski on Kope and in the summer they can try parachuting at the Carinthian Aero Club or visit the Ivarcko Lake or the church of St. Jurij, where there is an archaeological site. Daughter Karmen plays the zither, and son Andrej the diatonic accordion and trumpet. 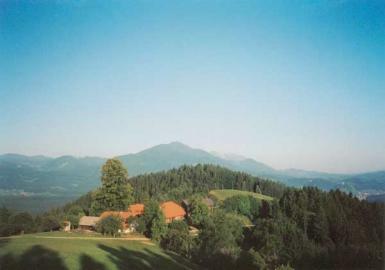 Activities in the area: tennis, outdoor swimming pool, skating, paragliding, hang-gliding, bowling and hunting.